Saturday - Monday May 25th - 27th, 9:00 - 3pm, The opening Memorial Day weekend BLA Annual Summer Raffle. Belgrade Lakes Village. The Belgrade Lakes Farmer's Market will be starting this year on Father's Day Sunday. Sundays in the Village are some of the most festive and exciting times! Fresh organic produce, Maine maple syrup, handcrafted jewelry and homemade ice cream are available weekly. At the Maine Lakes Resource Center. For more information: Call MLRC at 207-495-3617. You will also see your valued BLA Volunteers selling the 2019 Summer Raffle Tickets so please drop by and say Hello! 4th of July Belgrade Lakes Village Festivities, Click Here! 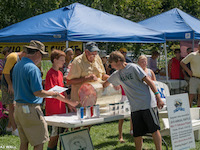 Annual Raffle Drawing at the Farmer's Market, Maine Lakes Resource Center, Belgrade Lakes Village. Don't miss this annual event! $30,000 in prizes will be raffled off! starting Sunday May 26th @ 8:00am at the Maine Lakes Resource Center!